green pea chutney to serve (recipe follows). Boil the potatoes in lightly salted water until soft. Mash them thoroughly with the butter, and fold in the feta, salt, pepper and herbs. Divide the mixture into 16, and roll each portion into a log about 12cm (4 inches) long. Place a log near the corner of a spring roll sheet. Roll the sheet over the filling, tuck in the sides, and roll up tightly. Seal the final corner with a dab of paste. Continue filling the remaining spring rolls. Heat the oil over moderate heat until fairly hot. 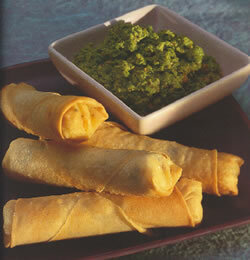 Deep-fry the spring rolls, turning once, for about 45 seconds, or until lightly browned, and drain on paper towels. Serve hot or warm with the green pea chutney. 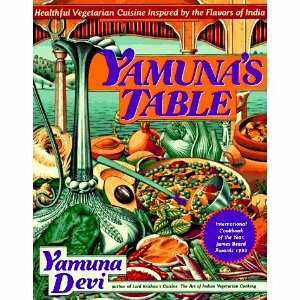 Adapted from a recipe by Yamuna Devi from her award-winning book . Pulse the toasted almonds in a food processor until finely minced. Add the remaining ingredients and process until smooth. If you prefer a looser consistency, add a little more water and pulse again. Serve with the spring rolls. Makes about 1 cups.